We ask you to consider making a donation to any of the booths and activities listed below and to place a tag on your donation with the name of the booth on it. All donations may be brought to the church entrances on weekends or to the parish office during the week. You may call the office at 724-9190. Please consider signing up as a volunteer worker at any of the Booths & activities. We are also in need of other Volunteers to assist during the event as well as after the bazaar closes to help clean up and reset the hall. If you can help and for information, call Cathie Gilligan at 401-451-7794. 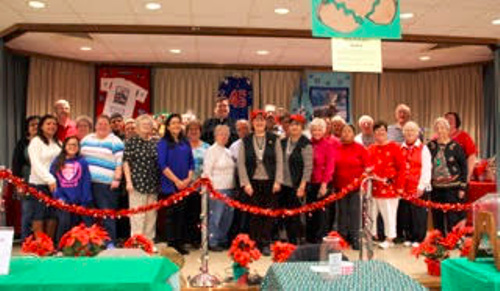 A Volunteer Form for the Bazaar is available in the Parish Bulletin. Please complete the form and place it in one of the blue boxes at the church entrances or drop off at the parish office. 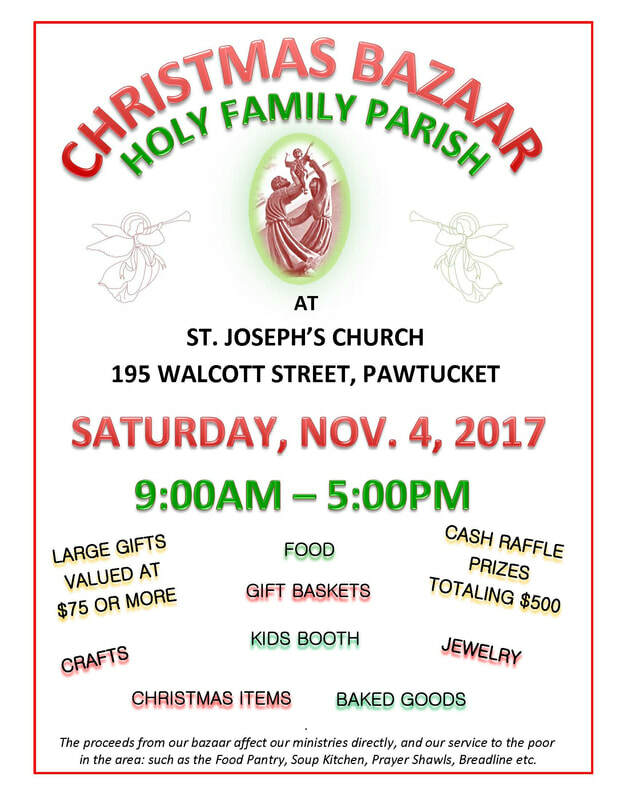 At this year’s bazaar we will again have a Rhode Island Basket and we are in need of donations of all types of items related to Rhode Island. Any donations are much appreciated and may be brought to the parish office and must be received no later than Tuesday, October 10, so the basket can be displayed at both churches prior to the Bazaar. BAKED GOODS BOOTH – We are in need of baked goods. Brownies, cakes, breads, cookies, cupcakes, pastry, sugar-free items, jams, relish, and other baked goods are some examples. Home baked items are always popular. Arrangements can be made to pick up items. CHRISTMAS ITEMS / CRAFTS – Christmas decorations, Nativity Scenes, Bows, Wrapping Paper, Home-made Crafts, etc. CHILDREN’S BOOTH – Many Games, toys, small grab bag items are needed. HIGH ROLLERS – New Items over $75, Gift Certificates, high end items. FOOD COURT – Hot dogs, hamburgers, chips, soda, water, coffee, and more with all condiments will be on sale during the bazaar. Any donated food items, baked goods, etc. must be dropped off in St. Joseph Church Hall on Friday, November 3rd and no later than 10:00 AM on Saturday, November 4th. Gift Certificates and Booth Items for the Bazaar are appreciated. Monetary Donations are also accepted. There is a Special Budget Envelope in your budget packets for this purpose. ​CASH RAFFLE PRIZES (Total $500) 1 st Prize - $250 2nd Prize - $150 3rd Prize - $ 100 Raffle Tickets are $1.00 each or 6 for $5.00. Tickets will be available after weekend Masses; on the day of the event, and through the parish office.